My name is Adrienne, and I hail from texas. We've had dogs sense 2000, but I didn't get my own until just about two and a half years ago. My first is D'Artagnan. (DArt) He is a sable and white parti mini poodle at 14 inches and 13 pounds. D'Ar is a lazy boy, always has been and fits 'old soul' very well. He likes dogs better then people, unlike 'Lo who is the opposite. He's my lazy couch buddy. My second dog is Shy'lo. 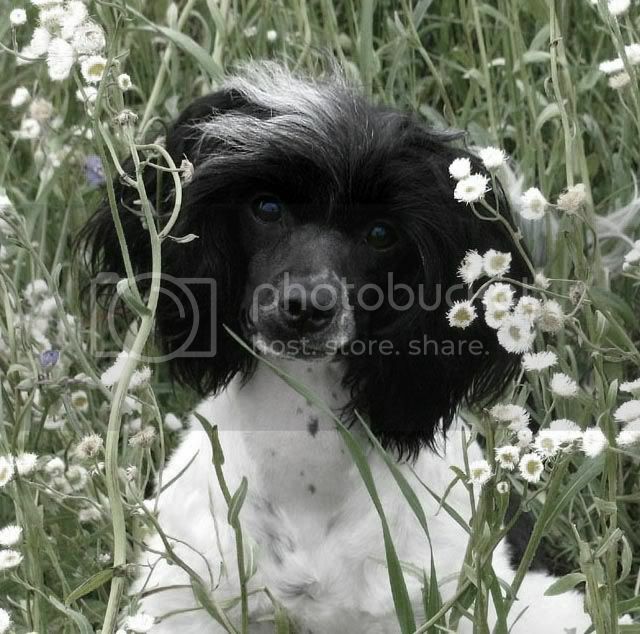 ('Lo) She is a B&W ticked poodle x cocker mutt. She just turned one and a half, and is a half inch and a pound larger then D'Ar. She is a high drive pup, always on the move. I got her into agility a few months ago, and she really loves it! As far as tricks both dogs know: Sit, Down, Stand, Shake, High five, Come, Stay, Roll Over, Wait, Bow, Fetch, In & Out, Leave It & Take It, back, and many other things I can't remember right now lol. 'Lo only: play dead, bark & hush, wall. D'Art only: Snap, crawl, beg. I'm working on play dead for D'Art, crawl for 'Lo, and working on a proper heel, common names for thinks like toys, people ect. As far as tricks being taught. Ok, here they are. I uploaded a few dozen others in my gallery as well including baby pictures of both if anyone is interested. wow!! what CUTE dogs you have!!! Poodles are soooooooooo smart, if you like training dogs, you've found a great site to stay inspired! !